Jazz can be popular music! Mercyhurst music professor Dr. Scott Meier -- saxophones, and singer Brittany Barko also join in some performances. 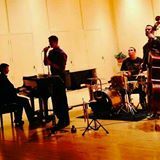 The group began in the practice rooms at Mercyhurst University’s Music Department, where Lucas and McLaughlin identified and explored their mutual interest in the music of the pianist Thelonious Monk. They were soon joined by Michael and Dillon, who heard what they were doing and wanted in. Along the way, the band discovered that trumpeter Shidemantle could also sing, and another dimension was added to the music. Both McLaughlin and Lucas have penned original tunes with lyrics, now part of the group’s repertoire. Listen to "There and Back," and "Quiet Girl." 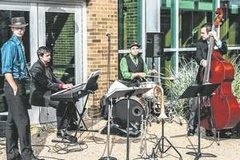 The band has now been together for over two years and, in addition to performances at Mercyhurst, has appeared at the Erie Ale House, the Anchor In, Wegman’s Cafeteria, the Erie Art Museum, the BrewErie and the Warner Theater. I heard members of the band most recently at a JazzErie Workshop led by jazz violinist Christian Howes at Mercyhurst on Feb 26. The band had the courage to serve as the subjects for Howes’ master class, playing for his critique – which informed not only band members but the rest of us on both basic and finer points of making instrumental jazz music. Great session! The Monk’s Brew is currently working on potential performance opportunities in Pittsburgh as well as local venues. Some of these ideas are practical ones: record an album, market it along with T-shirts through weekend tours. You can reach The Monk’s Brew for more information or to book the band by contacting Alex McLaughlin at 814/860-6711 or email amclau89@lakers.mercyhurst.edu.